So, if you EVER decide to move cities and countries, my first suggestion is to hire a fabulous real estate agent who will go to extreme lengths to find you the right accommodations either for rental or for sale (well, acquisition if you need to be nit-picky). My real estate agent found me a house in Aguascalientes that is about 5-7 minutes by bus or combi/pesero from the busiest street in the city, Boulevard Luis Donaldo Colosio. If you are a youngster (which I am not) or a foodie (which I am), the city street where you want to be is Colosio (it’s actually a boulevard, but you know what I mean). There is plenty of restaurants, bars, drink lounges, sushi bars, etc. on Colosio. So, accidentally, after we moved my living room, dining table and chairs and bed from where my parents live to Aguascalientes, my brother’s best friend (also my namesake, Raul), my Mom and I went for lunch, and we drove around Colosio to find a restaurant. We were glad we found Camperoni. Though my Mom still disputes whether we had lunch there (I drove to Aguascalientes this weekend to drop off some more house stuff that my Mom bought for me), I took a photo of the restaurant’s name. And yes, it IS Camperoni (though they only have a Facebook Places thing, instead of an actual website). 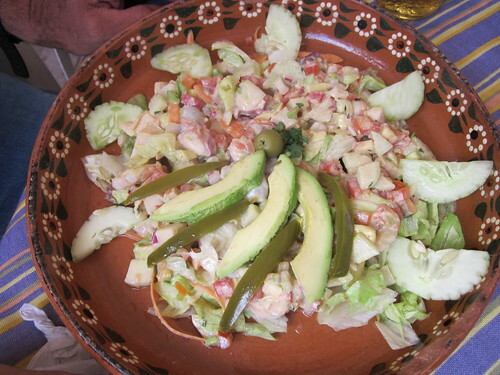 Raul ordered a shrimp salad (pictured above), whereas I ordered Pescado al Mojo de Ajo (garlic-infused fish). My Mom, contrarian as she is, decided to go with an Arrachera steak (thusly I did not want to take a photo, as Camperoni is a seafood restaurant). Absolutely delicious, and the prices for each entree were very reasonable ($80-120 pesos, which is about $6-10 Cdn dollars). I definitely will be a frequent patron of Camperoni. Disclosure: My Mom paid for all of our lunches on her own dime. As always, I retain full editorial control over anything posted on my site. Foodies make the best city guides. I’m living vicariously through your travels in Mexico… I would love to join you on your foodie adventures! What?! Your MOM paid?! 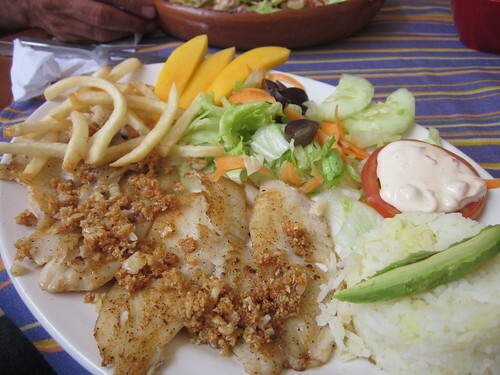 *LOL* I miss that yummy Mexican seaside food. Fish and salad …and of course cold, light tasting BEER.